Established in 1959, Pinney's of Orford are a 3rd generation family run business that specialise in producing fine quality smoked products due to the experience and understanding that they have gained over the years in both fishing and smoking. The smokehouses are still the original houses built by the founder Richard Pinney and are located next to Butley creek in Orford, Suffolk. They only use whole oak logs to produce their smoke and remain true to the old fashioned traditional way of flavouring and preserving without any additional ingredients other that smoke and salt. Pinney's place great importance on the sourcing of all of their products, making sure that they only obtain premium fish which are in the best condition for smoking. Their knowledge of each individual product allows them to take many factors into consideration when sourcing stock, and these play a vital role in the quality of the final produce. What better way to sample Pinney's beautiful produce than to take in a leisurely lunch or dinner at their great restaurant! A simple and uncomplicated approach best defines the restaurant, but it’s the great oysters, smoked delicacies, fresh local fish and shellfish that keep customers coming back again and again. The atmosphere is relaxed and informal, marble cafe tables, metal framed chairs and chalked up specials are all part of the charm. But the reason this little restaurant, tucked away on the Market Square at Orford is so popular is the superb quality of the fresh seafood. Check the website for menus and opening times www.pinneysoforford.co.uk, or call 01394 450277 to book a table. You'll find The Shop down by the Quay at Orford. Packed full of smoked delicacies, local produce and delicious ingredients, it's foodie heaven! The full Pinney’s range of products is on offer, smoked in their smokehouses down by Butley Creek, as well as a fresh fish counter where you can purchase daily catches from their fishing boats. Use the frozen counter to stock up on home produced cooking such as crab cakes, potted crabs or angels on horseback. Along with a great selection of carefully chosen pickles, chutneys, flavoured oils, jams, jellies, smoked olives and delicious accompaniments on offer, it makes for the perfect tasty lunch. Looking for a gift? 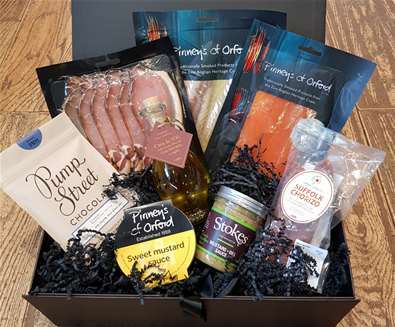 Pinney's hampers make the perfect present for a real foodie. Chose one from the luxury range or make your own selection for that really personal touch. Gift Vouchers are available too, which are redeemable both in the shop and up at the restaurant, The Butley Orford Oysterage. Pinney's of Orford look forward to seeing you soon but do remember that if you are pushed for time, most of the products in the shop can be purchased on-line, with next day delivery available.